﻿ Multifunctional drilling rig_Construction Machinery _Products _CHTC JOVE HEAVY INDUSTRY CO., LTD.
CHTC JOVE new generation Long Auger Drilling Rig absorbs the same product’s advantages in worldwide and also improves the weakness of traditional domestic products. Whole machine adopt self erection frame work. No dispatches in transportation improve the efficiency in installation. The function can be altered by change the pulley combination for rotary drilling or CFG construction way. Different hammer construction way also can be realized in this machine. 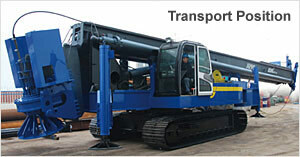 Self-extendable crawler insures stability in transportation (3400mm) and also meet construction requirement (4600mm). Crawler extend-retract operation controlled by hydraulic power which is fast and precision. 800mm width crawler could meet work in soft ground job sites. Main mast adopts two flexible sections. Extend-retract operation guides by one winding. There are two height choices, 29m for CFG and 24m for rotary drilling and hammer. All height adjustment operation complete by machine itself. Main mast use stable three points support. Universal jointed shaft in the mast bottom which promise precision adjustment and reliable structure. Unique triangle base structure not only afford erection task but also finish side move without whole machine move. Main mast section use table rectangle structure. Allocate CFG or rotary drilling rig work by change the pulley combination. Good sight for the operator as the front cab design. Anti-drop network is settled to ensure safety of the driver. Adopt PLC in operation system. Drilling depth, rotation location and vertical degree are shown on the display screen which supplies direct information to the operator. The operation platform use man-machine interaction way for check and adjust the parameters. Instead of fuel, we use electricity which is energy saving and no pollution. The main platform adopt large box-type structure section with powerful carrying capacity and rigidity. Double support in slewing driver part have the ability to avoid the rotary gear loosen or broken in traditional structure. The main platform structure is simple and easy for maintenance. Light weight, flexible in movement, efficient in piling, meet different jobsites construction requirements, large torque, energy saving and no pollution. With high quality and competitive price, CHTC JOVE new generation Long Auger Drilling Rig is an excellent choice for our customers.